In all previous examples in this chapter, the process has erased data or wiped data from a physical drive. 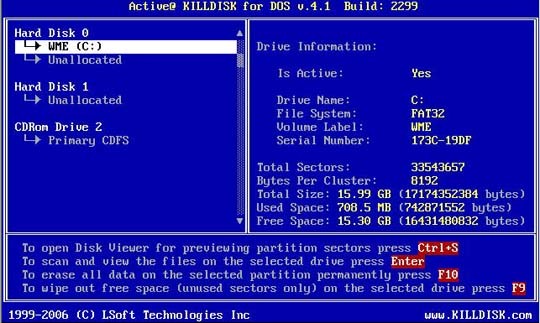 Using a similar method, you can erase or wipe logical disks and partitions, and even "Unallocated" areas where partitions used to exist and the area was damaged, or the area is not visible by the current operating system. To erase data from a logical drive, open the DOS Interactive Mode screen and follow the steps below. All system hard drives and USB / floppy drives will be displayed in the left pane along with their system information in the right pane. Position the cursor over the logical disk or on the Unallocated area. Press [F10] to securely remove data. Follow directions to set up erase parameters. To wipe data from a logical drive, open the DOS Interactive Mode screen and follow the steps below. Position the cursor over the logical drive. Press [F9] to wipe data from unoccupied areas. Follow directions to set up wipe parameters. After operation is completed successfully, information on how drives have been erased or wiped is displayed. An example of an erase session is displayed below. If the process encountered errors, for example from bad clusters, a summary of errors is presented in this report. Use the keyboard arrow keys to scroll through the report. To save the log file, press [F2]. Details of this report are saved to a log file located in the USB / floppy from which you started Active@ KillDisk.